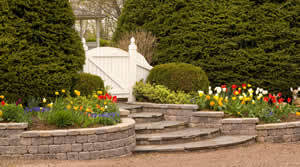 Get a pro to evaluate your yard and gardens to see if you need a retaining wall or get a free estimate! Let our experienced team take a look if you are located in the Maryland or Washington DC area. A stone wall is not only beautiful but multi-functional. It outlines space for decorative plantings and can also provide a seating area. It increases the beauty of a garden as well as protects property from the detrimental effects of erosion. The possibilities are endless in and out of the garden. The stackable stone retention wall system can also be used to create patio space with freestanding walls, complete with matching entry stairs. Rough hewn stone is available in a multitude of colors and shade variations. Crafted for quick and easy installation, it is a favorite with home builders and landscapers. Stones are available in multiple sizes, making smaller scale projects, such as a fire pit, a perfect match to a larger wall. Traditional stackable stone usually has vertical limits of around four feet. This can be overcome by using locking stackable stone products for taller retaining walls or patio dividing walls. Capable of constructing barriers up to 50 feet in height, these are mortarless products that can deliver. Locking stackable stones are designed with the simplicity of traditional stacking stones. However, they contain a structural interlock for strength and stability that allows for tall, sturdy walls. Easy installation means a hardscape project of epic proportions can easily be accomplished. Locking stackable stone is versatile, offering great flexibility in design ideas. It is available in a variety of textures and colors, so homeowners can easily have a hardscape project that blends into their existing home design. An array of sizes and shapes allows a perfect fit, large or small. Whether it is straight lines and right angles or an elegant curve or column, locking stackable stone can accommodate the design. Going green is becoming increasingly important to homeowners. 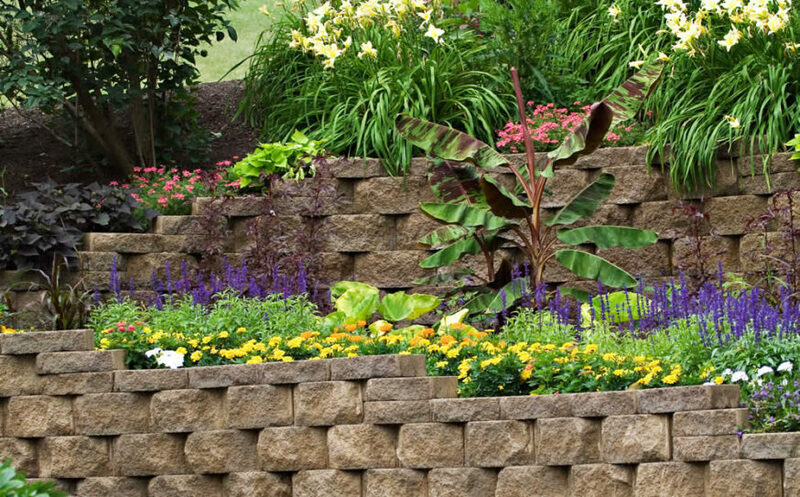 Living walls are an innovative retaining wall solution to use in such a case. Green structures have limitless architectural and design possibilities: retaining walls, fencing, vertical panels, and even roofs. Equal in aesthetic appeal as a classic stone retaining wall, the effect, however is different. Creating a greener space creates a cooler environment. For patios and backyard spaces where heat is an issue, living walls can make outdoor activities more pleasant in warmer weather. This natural solution also creates habitat for nature’s creatures. For homeowners who enjoy birdwatching or find delight in woodland animals, a greener design tempts them to enjoy your backyard too. There are also environmental benefits of a living wall. 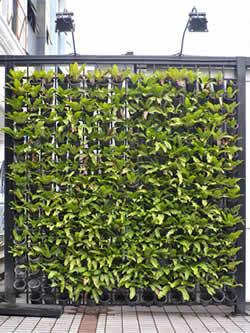 Homeowners who find sustainable living a priority should consider a living wall to reduce air pollution contaminants. Timber is another option for retaining wall systems. Stained wood is a warm and natural complement to plantings. With proper water proofing treatment, quality timber can last for years, weathering beautifully. And timber is not just for use with a log cabin style home. Urban landscapers widely use treated timber to create retaining walls for modern living spaces as well. Pressure treated timber is easily available and can be cut to fit even tight backyard and patio spaces. Skilled contractors are not limited to only squaring right angles. An experienced craftsman can also create gentles curves in just the right places. Advantages of timber are versatility. For environmentally aware homeowners, it is also possible to use recycled timber to upgrade outdoor spaces that agree with your conscientious ideals. Composite timber is also available which is a product that does not degrade and decompose, lengthening the lifespan of your outdoor project. Design: Take time to sketch a design of what you have in mind. When shared with a contractor this will help to convey your desires much better. Principles: Don’t be shy about including your own personal principles in how you want your outdoor space created. By sticking with your principles it will only enhance your pleasure when enjoying it. After-The-Fact Impact: Consider how any design will affect your surroundings. Water runoff from rainfall is one of the most important factors. Perform a complete survey of the property, keeping in mind how any element will affect the environment after project completion. Repeat this survey with your contractor. Also consider any toxic chemicals building materials may contain and whether these may leach into surrounding soil or groundwater. Maintenance: When selecting materials, as well as developing a design, remember that maintenance is a lifetime commitment. How much time, expense and energy are you willing to commit for things like: repainting, resealing, repairing or replacing stones and pavers, etc. For more information on professional landscaping services for either new construction, maintenance, or renovations in the mid-Atlantic region, please call 301-951-1244 or reach out online. At Rasevic Landscape Company, our skilled team has been serving our clients with courteous, expert services for more than 25 years. We offer extraordinary care for our clients’ needs in maintaining the beauty of the outdoors surrounding their homes. Homeowners can be confident that their outdoor spaces are our priority and expertise!